The Fellowship was fortunate enough to obtain a copy of ONYX #1 from IDW Publishing. The story is by Chris Ryall, with art by Gabriel Rodriguez, colors by Jay Fotos, and lettering by Shawn Lee. It’s Earth in the year 2083. The planet’s population of over 10 billion people has just increased by one – a warrior from another planet. She has a mission to accomplish, but will the International Global Defense Army allow her to complete her task? Or is Earth doomed to the same fate that our mysterious visitor’s home planet suffered? 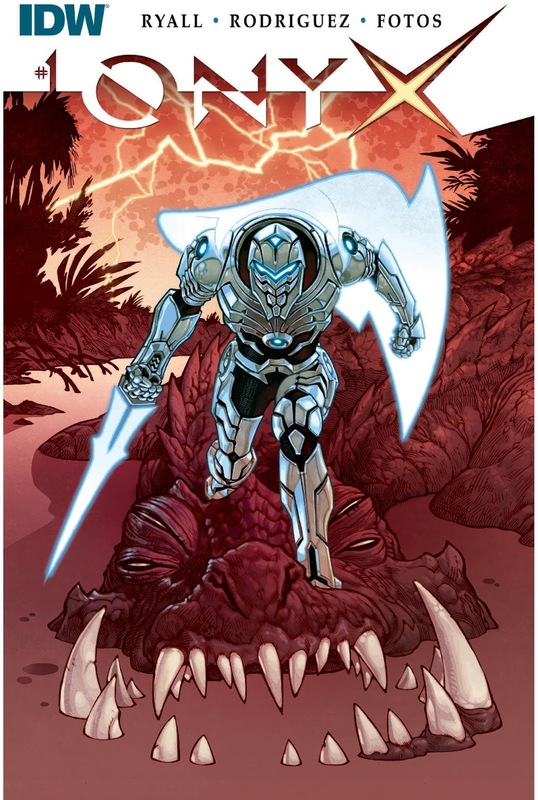 Onyx is an armor wearing survivor trying to save Earth from an alien menace. If you’re a child of the 80’s (or read the comics from that time), you can figure that it sounds similar to ROM THE SPACEKNIGHT comic/toy line. But it’s more than that…way more. Ryall gives us an Earth of that, while based in Sci-Fi, does seem like a possible future with overpopulation and the declining availability of natural resources. The story’s pacing is real good as well as the supporting characters. Gabriel Rodriguez and Jay Fotos are up to the task of creating a new, yet somewhat recognizable world and the threat that it faces. Really great start to what could be a cool series. ONYX #1 is in stores now, or available for ordering at www.Idwpublishing.com.